As you might expect, Mariah Carey makes a few demands when you work with her on a movie. For instance, when she filmed an appearance in the upcoming Will Ferrell–Amy Poehler comedy The House, according to co-star Rob Huebel, she needed white roses and some stuffed lambs in her trailer. She arrived four hours late. She didn’t want to sing the song she was hired to sing. She also had a few notes on the script, which stipulated that her character, Mariah Carey, would be killed by gunfire. “So then they were going to do this bit where they shoot her, I think, and they kill her — in the movie. Not in real life,” Huebel explained in an interview on EW’s SiriusXM station. “But she didn’t want that. She was like, ‘I don’t think my character would get killed by bullets. What if I deflected them like Wonder Woman?’ They were like, ‘Mariah, we don’t have time for [this]. You’re getting paid so much money. We have you for one day. We don’t have time to argue with you. 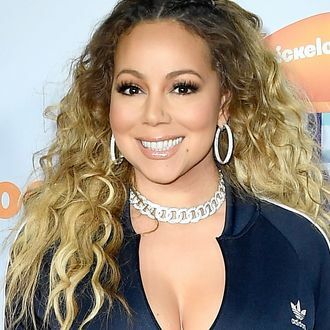 Just do it.’” Huebel isn’t sure if Mariah’s death actually made it into the film, but if you ever want Carey to cameo in your own film, it will likely serve you well to remember that she is both an elusive and immortal chanteuse.